The third year of KUC Jazz Vespers ended the season with a walk through Holy Week. “Holy Week in Four Movements” offered beautiful and poignant music which deeply brought to the heart the stories of the Parade into Jerusalem, the Last Supper, the darkness of Crucifixion and the joy of Resurrection. 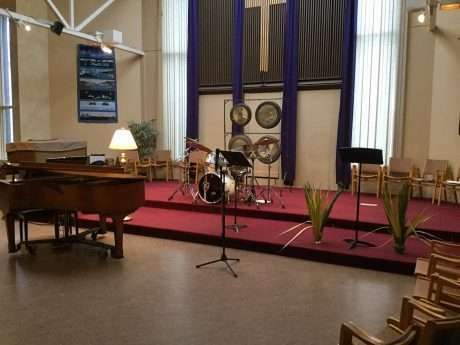 The readings from scripture were experienced more deeply through the sounds of piano, bass, drums and gongs, saxophone and voice. Rob, Syd, Wilf and Alix each spoke sharing their thoughts on how much their being a part of Jazz Vespers has meant to them individually and as a group, and each expressed their appreciation for Bruce’s encouragement and enthusiasm for inviting them to be part of this alternative worship. Syd Griffith astonished us by sharing that most of the group, which originally included Syd Takahashi, had not played jazz before this adventure began. It was fantastic to have Abby, a student at Beatty School of the Arts in Kamloops, as the guest vocalist. We are so grateful to have enjoyed this gifted group who have shared their love of music and reflection, and to Bruce Comrie who put it all together three years ago and who continued to enrich and deepen our experience with his delightful introductions of the music and his thoughtful reflections. It was pretty obvious all the way along how much Bruce loves music! Thank you Bruce. Bruce reflects on Holy Week through scripture readings. The Jazz Vespers Family: Mary, Bob, Alix, Wilf, Syd, Rob, Bruce, Lesly, (in front) Jane, Jean and Abby.